A seesaw in the form of an animal is the Miyazato Dai-Ni Park mascot, and visiting children are filled with laughter has they play and frolic on the playground. Miyazato Dai-Ni Park is small, almost intimate by some park standards, surrounded by a residential neighborhood. 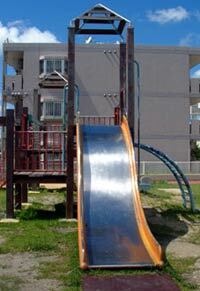 Still, it’s popular with children because of the relaxed atmosphere on the fun-filled playground during daylight hours. 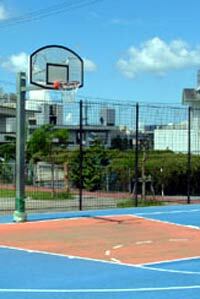 The adjacent basketball court offers challenges for the more athletically inclined youngsters. For parents, the park is a place to kick back and soak up the Okinawa sun. There’s a shaded lounge area, and plenty of green space to simply lay down and gaze up at the blue sky while listening to the breeze. A visit to Miyazato Dai-Ni Park is only a short drive from Kadena’s Gate 2 Street. Drive Gate 2 Street to Goya Intersection and make a left turn. Continue past the Misato post office to the Mister Donuts. At the donut shop take a right turn and go straight about 200meters, and you’ll see AU Shop Miyazato Branch. Pass AU, continuing on toward Union Supermarket. Just before the supermarket look for a vending machine. Turn left and the park is at the end of the street.